A wallop of flavour when you least expect it. A clean, mid-bodied blend that starts smoky but surprisingly delivers complex flavours with a floral finish. 23 Degrees' very first blend! It was a true labour of love; just when they thought it was right, they weren’t satisfied. 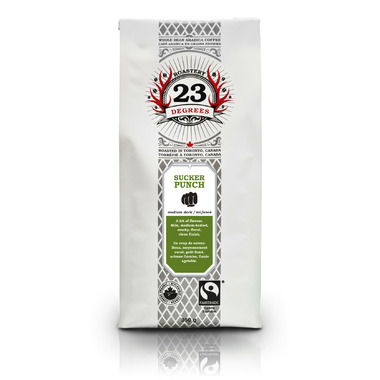 23 Degrees wanted something that would harbour complex flavours and a pungent aroma, and finally found a blend of beans that delivered a mild, easy-drinking and flavourful coffee suitable for any time of the day. 23 Degrees Roastery uses Arabica coffee beans that are certified Organic and Fair Trade. My husband is a total coffee aficionado and I bought this for him to try. He absolutely loved it. Love this coffee! It's the only one my wife will drink now.